﻿ Cooking oil allergens? Not in ours! Cooking oil allergens? Not in ours! The other night, while my wife and I were enjoying a Ninja-Licious burger at a local establishment we frequent, my phone rang. 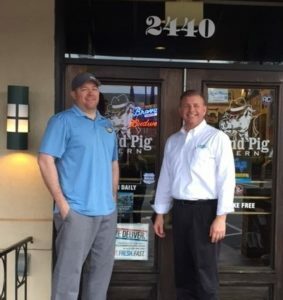 The caller was Kell Dodson, General Manager of the Blind Pig Tavern in Athens, GA. Kell was in the office trying to find information on allergens in the cooking oil we provide him. I let him know I was in his dining room and asked him to come out and see me. I was happy to share with Kell that the oil we provide him is allergen free. As it turned out, he needed to know because another patron in the tavern was preparing to order dinner with her young child and had concerns. Kell was then able to share the information with the patron and answer the questions she had in order to safely handle the child’s order. With increasing consumer awareness regarding food allergies and ingredients, restaurants are facing these questions on a regular basis. I have included a link to a statement regarding allergens in cooking oil. I hope this is helpful to all Restaurant Technologies customers, prospects, and their patrons.